Strange Things Happening Every Day: DESERT ISLAND LP #1 -- GARY LEWIS AND THE PLAYBOYS' "GOLDEN GREATS"
DESERT ISLAND LP #1 -- GARY LEWIS AND THE PLAYBOYS' "GOLDEN GREATS"
In 1964, Gary Lewis and the Playboys auditioned for a job at Disneyland without telling Disney employees that Gary was the son of the great Jerry Lewis. The entertainment director of the park liked what he heard and hired Gary and the boys on the spot to perform at the Space Bar in Tomorrowland. Legendary record producer Snuff Garrett lived just two doors down from Gary's famous father, and Jerry and Snuff had a mutual friend, conductor Lou Brown, who'd worked with Jerry ever since the Martin & Lewis days. Brown had brought Gary Lewis to Snuff's attention. Garrett would later recall: "I got to thinkin' that, hey, if I can get a record cut with Gary, it'd be a new way to promote records -- the son of a famous entertainer!" The first song that Garrett brought to the group was "This Diamond Ring," which had originally been offered to Bobby Vee. The session was financed by Gary's mother, Patty Lewis. During the actual recording, the Playboys were almost irrelevant since they weren't allowed to play their instruments and their voices were used sparingly. Snuff wanted a hit, so he insisted on using trusted studio musicians. Garrett got "This Diamond Ring" on the radio in New York City by making a deal with WINS disc jockey Murray the K., who ran a series of all-star concerts at theaters around New York Murray was promised that, if he played Lewis' record, the Playboys would play on his shows. Then Snuff had his neighbor, Jerry Lewis, pull some strings to get his son on The Ed Sullivan Show. Within a few weeks, Gary and his group were on America's top variety program. But it was Sullivan's policy that all the acts appearing on his show had to perform live. Since so many studio tricks had been used on "This Diamond Ring," there was no way that the Playboys could re-create its sound. So a compromise was struck. Gary sang along with pre-recorded tracks as the Playboys faked it on their instruments. According to Garrett, this marked the first time that a song had been lip-synched on the show. Gary Lewis and the Playboys were instant stars. Their song "This Diamond Ring" shot up to #1 and the pressing plants ran 24 hours a day to keep up with the demand for the record. 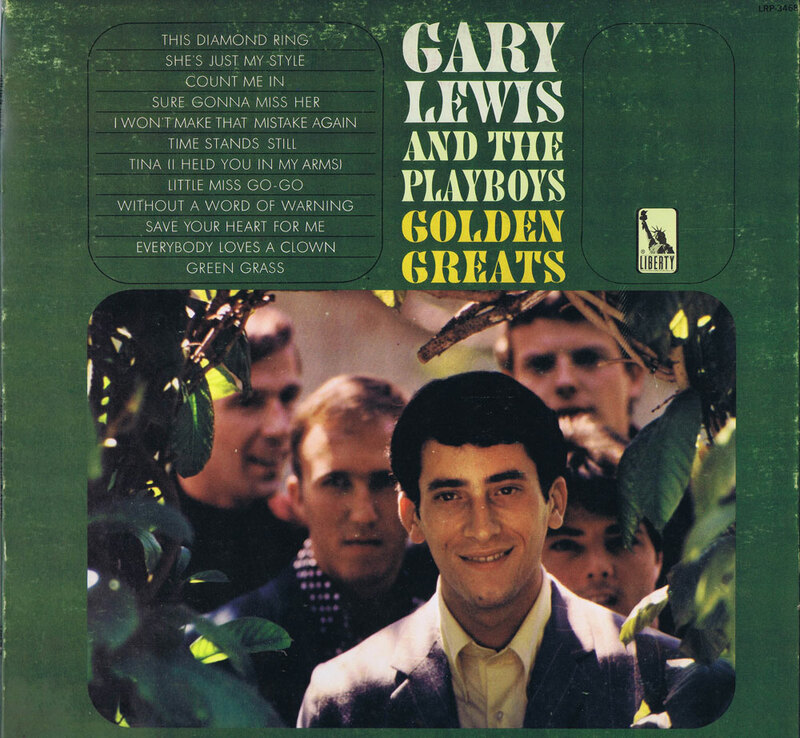 By 1965, Gary Lewis was Cash Box magazine's "Male Vocalist of the Year," winning over nominees Elvis Presley and Frank Sinatra. He was the first and only artist during the 1960's to have his first seven releases reach Billboard's Top 10 on the Hot 100 chart. In the Philippines during this time, Gary Lewis and the Playboys were considered to be America's answer to the Beatles, and over a two-week period, sold out the Arianeta Coliseum there for 24 performances. Along with his appearances on various popular television shows, including American Bandstand, The Joey Bishop Show, and The Tonight Show, Gary accumulated an impressive five appearances within two years on the Ed Sullivan Show. Between 1965 and 1966, Gary Lewis and the Playboys rattled off an impressive string of hit singles. "This Diamond Ring" (#1), "Count Me In" (#2), "Save Your Heart For Me" (#2), "She's Just My Style" (#3), "Everybody Loves A Clown" (#4), "Sure Gonna Miss Her" (#9) and "Green Grass" (#8) -- all collected on this definitive album. In their short-live career, Gary Lewis and the Playboys in total had eight Gold Singles, 17 US Top 40 hits, and four Gold albums, and sold 45 million records worldwide. In 1971, Gary retired from performing and opened a music store in San Fernando Valley, where he sold drums, guitars and accessories. He found, however, that he still had the urge to play, and in 1973, put a group together called Medicine out of Tulsa, Oklahoma, which included Bill Cowsill, formerly with the great '60s pop band, the Cowsills. The band failed to meet with any success. In1984, Gary put a new version of the Playboys together, and began performing almost 100 shows a year with '60s pop groups like The Grass Roots, Peter Noone (of Herman's Hermits), the Grass Roots, the Turtles, and the Buckinghams to cash in on the burgeoning Sixties nostalgia biz. Gary also appeared and performed on many of his father's Labor Day telethons for the Muscular Dystrophy Association. Despite Gary Lewis' string of hits and popularity during the '60s, one thing's for certain: Not even the influence of his famous father will be able to get him into the honored position as a member of the Rock 'n' Roll Hall of Fame.